I absolutely loved this it is beautiful & good quality. Bring a casual aesthetic to the room with these geometrically arranged patterns. The Hazelwood Set has large ninepatch blocks of plaid alternating with 5-point stars that lift their pattern from the blocks. Quilts feature three wide channel borders of black, mustard, and crimson to help frame the design. Dimensions 95.0 In. X 105.0 In. X 1.0 In. Very beautiful set. One thing to note that I made a mistake on - the border outline that looks gray is actually a black/beige plaid. Hope that is helpful when trying to find sheets that match. It is a bit pricey for what is included, but it works perfectly for how our bedroom is set up and matches our furniture perfectly. Update: I love the way this looks in our bedroom. It is perfect! And very, very soft and comfortable, too! As stated before, I thought this item was a bit pricey, but it has a lot of hand-stitching, so I can now understand why. Would definitely recommend! Absolutely love this quilt set!!! The color & quality are amazing. 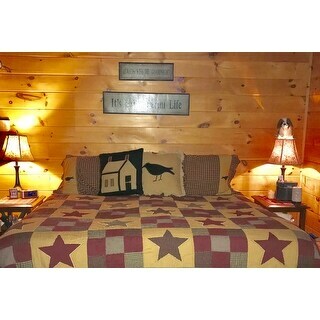 If you are looking to bring primitive country to your bedroom this is the set to get. Love that the shams are included. Love the look of this quilt and shams! The colors blend terrific with my new rugs as well. I would definitely recommend this purchase to others. I absolutely love this quilt set! I ordered California king and was worried it wouldn't cover my California king bed well. It covers it perfectly! The shams have ties in the back making it easy to put pillow in. Very satisfied! I love the VHC brand, it is one of my favorites for bedding, bath, dining, and kitchen. I have several quilts, bed-skirts, pillows, curtains, rugs, napkins etc. These are perfect if you like the Farmhouse theme. They are good quality not to mention the prices are great considering they are hand stitched and machine sewn. I received in 5 days time. Overstock is always great to work with. 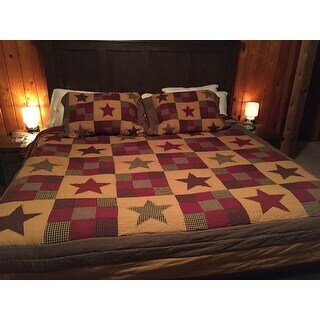 I also got the two pillows shown to go with this quilt set.pillow works . I love it! 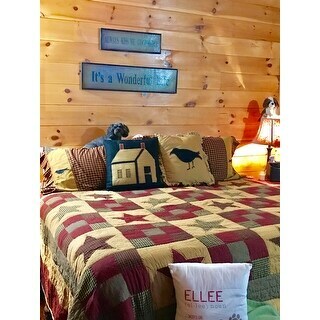 I absolutely love my quilt set ,it was even more than what i was expecting, i ordered queen, and it fit perfect ,and the colors were perfect, i would recommend this to everybody.,,,,,love it!!!! Is quilt fits my color scheme perfectly. The quality is excellent and it is well made. It is on my bed now and I love it! Comfortable weight, and the colors are perfect! Love this quilt set. Had previously purchased the twin set and then we decided to buy bunk beds with a full size bottom bed for our grandsons when they stay over. So purchased the full. Just perfect!! Colorful but yet not overly done. I absolutely love these quilt sets! I would certainly purchase them again! Absolutely love this bedding !! Item shipped quickly and arrived on-time and as scheduled. Bought this as a gift, so I can't attest to the quality of the product, but it looked good from outside the package. "I have been eyeballing this quilt set for weeks, but I'm kind of leary because of the care instructions. If it can't be dried in a dryer, how do I dry it? There are no clothes lines where we live, and line drying is unrealistic given our typical weather." We do not recommend the use of a dryer on our quilts to preserve their life. Typically we recommend that they are laid flat to dry.
" how do I get the skirting and the pillows that go with it"